After being presented with a last, best and final offer from FlightSafety Services Corporation (FSSC), the machinists who train pilots and maintain flight simulators for the new KC-46 at McConnell AFB in Kansas have voted to strike. The membership voted 100% to take such action. The main reason the offer was quickly rejected by the membership was the omission of language that would designate this group as part of the Service Contract Act or SCA, a government rule which requires contractors and subcontractors to pay area wages and benefits that are determined by the government. Without such a designation, the IAM members at MCConnell AFB, who take care of the men and women that fight for this Country, are paid less than their counterparts working in the same industry. The bottom line – right now these diligent and tireless machinists are being paid less than the minimum standard set by the federal government. Although it was ultimately the decision of the U.S. Air Force contracts office to not include this designation of SCA for this government contract, but rather let it fall to the Department of Labor, labor representatives in Wichita believe the company has an opportunity to do right by these working Americans. Tyson Kelly, District 70 Business Representative and part of the negotiation team, believes this tight group of 17 bargaining unit members are entitled to the respect they give day in and day out to our U.S. Armed Forces. “Our members provide the best training available to the men and women in uniform. They should be able to provide for their families with their paychecks and not have to constantly worry about their futures being in jeopardy or at stake. There’s something fundamentally wrong with that scenario,” said Kelly. The strike begins at 6 a.m. on Tuesday, February 12, 2019. 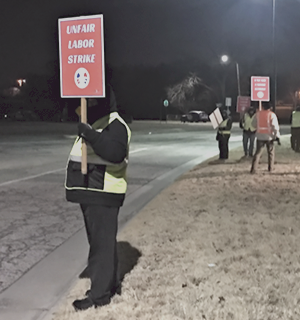 The post Local Lodge 708 On Strike appeared first on IAMAW.